The suicide of emperor Nero, in AD 68, was followed by a brief period of civil war – the first Roman civil war since Mark Antony’s death in 30 BC. Between June and December of AD 69, Rome witnessed the successive rise and fall of Galba, Otho and Vitellius – until, ultimately, the accession of Vespasian – the first of the so-called Flavian dynasty. The social, military and political upheavals of this year had Empire-wide repercussions, which included the outbreak of the Batavian rebellion. Galba was Roman Emperor for eight months from AD 68 to 69 and was the governor of Hispania Tarraconensis, when he made a bid for the throne during the rebellion of Julius Vindex. 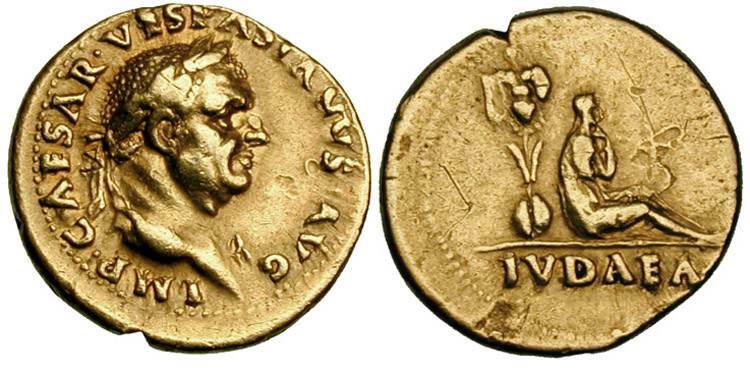 Aureus July 68 – January 69, 7.22 g. IMP SER GALBA CAESAR AVG P M Laureate head r. Rev. Galba, bare-headed and in military dress, riding r., rising r. hand in salutation, in exergue Extremely rare and among the finest aurei of Galba in existence. GALBA. 68-69 AD. AR denarius. GALBA-IMP (starting at 7 o’clock, reading clockwise) Laureate head r., with globe at point of bust. / HISPANIA Hispania, draped, standing l., holding corn ears and poppy in r. hand and round shield and two vertical spears in l.
Otho did not have a record for tyranny or cruelty and was expected to be a fair emperor but his efforts to restore peace and stability were dashed by the revelation that Vitellius had declared himself Imperator in Germania and had dispatched half of his army to march on Italy. Otho was not keen to begin another civil war and sent emissaries to propose a peace and convey his offer to marry Vitellius’ daughter. It was too late – Vitellius’ generals had half of his army heading to Italy. After a series of minor victories, Otho was defeated in the Battle of Bedriacum. Rather than flee and attempt a counter-attack, Otho decided to put an end to the anarchy and committed suicide. He had been emperor for a little more than three months. Otho. AD 69. Gold Aureus, 15th January – 9th March 69, AV 7.26 g. IMP M OTHO CAESAR AVG TR P Bare head r. / PAX ORB – IS TERRARVM Pax, dressed, standing l., holding branch in r. hand and caduceus in l.
Otho. AD 69. Silver Denarius (19mm, 3.48 g, 6h). Rome mint. IMP M OTHO CAESAR AVG TR P, Bare head right / PAX ORBIS TERRARVM, Pax standing left, holding olive branch and caduceus. On the news of Otho’s suicide, Vitellius was recognized as emperor by the Senate. Vitellius focused on the pursuit of every possible rival, inviting them to the palace with promises of power only to have them assassinated. Meanwhile, the legions stationed in Egypt, Iudaea (Judea/Palestine) and Syria acclaimed Vespasian as emperor. A strong force drawn from the Judaean and Syrian legions marched on Rome under the command of Mucianus. Vespasian himself traveled to Alexandria where he had been acclaimed Emperor on July 1, thereby gaining control of the vital grain supplies from Egypt. Surrounded by enemies and with the Danube army at the gates of Rome, Vitellius went into hiding but was caught and killed by Vespasian’s men. In seizing the capital, they burned down the temple of Jupiter. The Senate then acknowledged Vespasian as emperor on the following day. VITELLIUS. 69 AD. AR Denarius (3.26 gm). Rome mint. A VITELLIVS GERMANICVS IMP, Bare head right; early transitional type with features of Otho / CONCORDIA P R, Concordia seated left, holding cornucopiae and patera. The Flavians rose to power during the civil war of AD 69, known as the Year of the Four Emperors. Although the dynasty proved to be short-lived, several significant historic, economic and military events took place during their reign. Three emperors belong to this dynasty – Vespasian, Titus and Domitian. Through his general Agricola, Vespasian increased imperial expansion in Britain. Vespasian gold Aureus. Rome mint, 21 Dec 69 through early 70 AD. IMP CAESAR VESPASIANVS AVG, laureate head right / IVDAEA in ex, captive Jewess seated right, hands tied before, trophy of captured arms behind. His generosity in relieving the suffering caused by two disasters, the eruption of Mount Vesuvius in AD 79 and a fire in Rome in AD 80. After barely two years in office, Titus died of a fever on 13 September, AD 81. As Emperor, Domitian strengthened the economy by revaluing the Roman coinage, expanded the border defenses of the Empire, and initiated a massive building program to restore the damaged city of Rome. Significant wars were fought in Britain, where his general Agricola attempted to conquer Caledonia (Scotland), and in Dacia, where Domitian was unable to procure a decisive victory against king Decebalus. Domitian’s saw himself as the new Augustus, an enlightened despot destined to guide the Roman Empire into a new era of brilliance. Religious, military, and cultural propaganda fostered a cult of personality, and as a consequence, Domitian was popular with the people and army but considered a tyrant by members of the Roman Senate. According to Suetonius, he was the first Roman Emperor who had demanded to be addressed as dominus et deus (master and god). He worshiped the goddess Minerva and she regularly appeared on his coinage—in four different attested reverse types – and he founded a legion, Legio I Minervia, in her name. Domitian’s reign came to an end in 96 when he was assassinated by court officials. The same day he was succeeded by his advisor, Nerva. After his death, Domitian’s memory was condemned to oblivion by the Roman Senate and propagated them memory of Domitian as a cruel and paranoid tyrant. Roman aureus minted in 83 during the reign of Domitian. Domitia appears on the reverse with the honorific title Augusta. 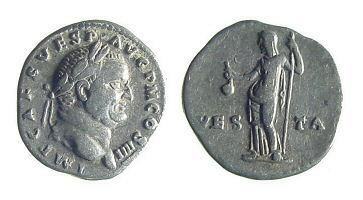 Upon his accession, Domitian revalued the Roman currency by increasing the silver content of the denarius by 12%. This coin commemorates the deification of Domitian’s son. Part 3 has been published !